Israel said its forces “hit all of Iran’s infrastructure in Syria“, commenting on the attacks it launched in response to the firing of rockets from Syria at Israeli military bases in the Golan Heights, at dawn on Thursday. Hours after the Israeli strikes, Defense Minister Avigdor Lieberman said that Israel had hit all of Iran’s infrastructure in Syrian territory, expressing the hope that this chapter is over . Footage showed the moment the missile attack from Syria hit Israeli military bases in the Golan Heights, leading to one of the heaviest Israeli strikes since the start of the Syrian conflict in 2011. The footage, which was published on social media sites, monitored the firing of dozens of rockets, which Israel said were fired by Iranian forces deployed in Syria to support Syrian President Bashar al-Assad . Israel said that Iran fired 20 Grad, dropped by the Iron Dome missile defense system or did not reach the targets in the Golan, but the Syrian media reported that the strikes hit targets. Israel considered the Quds Force, the arm responsible for the external operations of the Iranian Revolutionary Guards, to have fired the missiles. Military spokesman Lt. Col. Jonathan Conricos said Qassem Soleimani ordered the attack. According to Syrian sources, the Israeli response is represented by dozens of Israeli rocket strikes that hit a Syrian radar and air defense site and an ammunition depot, highlighting the danger of a wider escalation involving Iran and its allies in the region. Jonathan Conricus said the strikes succeeded in destroying dozens of Iranian military positions in Syria, as well as Syrian anti-aircraft units that tried to shoot down Israeli planes but failed. It is the first time Iranian forces have bombed Israel from Syria, where it has been deployed along with pro-Iranian factions to support Assad in the seven-year war. Expectations of the regional situation have increased after US President Donald Trump announced Tuesday the withdrawal of the United States from Iran’s nuclear deal. Hours later, Israeli missiles targeted a military base in al-Kaswa. Remarkably, the strikes on Thursday were hours after the return of Israeli Prime Minister Benjamin Netanyahu from a visit to Moscow where he discussed concerns about Syria with Russian President Vladimir Putin. Konricos said that Israel notified Russia in advance of Thursday’s strikes, which were official Syrian media reported hitting the city of the Baath in Quneitra near the border. 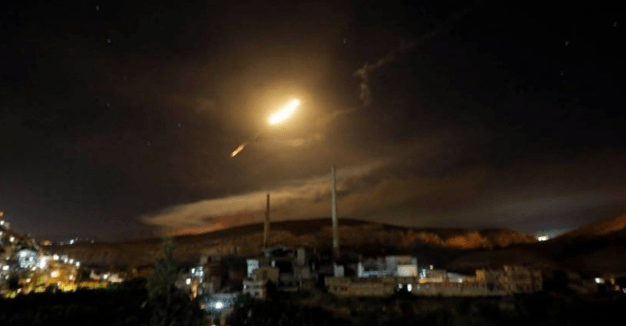 The Israeli army targeted several sites inside Syria with dozens of missiles after shelling of Israeli military targets in the occupied Golan from inside Syria. The Israeli army statement said that Russia was notified before the Israeli strikes on dozens of military positions belonging to the Iranian Quds Force inside Syria. The Israeli Prime Minister Benjamin Netanyahu ruled out Wednesday, after meeting with Russian President Vladimir Putin in Moscow. Russia is seeking to reduce the Israeli military operations in Syria, according to Reuters. Netanyahu traveled to Moscow on Wednesday to meet Putin hours after US President Donald Trump announced his withdrawal from the Iranian nuclear deal and after Syria accused Israel of carrying out a new missile attack on a military base near Damascus. Netanyahu told reporters before leaving Russia: “Given what is happening in Syria at the moment, there is a need to ensure the continuation of military cooperation between the Russian and Israeli armies,” referring to a hotline between the two countries aimed at preventing an accidental clash.